Last week's Layout Challenge at The Studio Challenges was instantly inspiring. I knew exactly which photograph I wanted to use and it took mere minutes to pull together the right elements for the page because my Counterfeit Kits were ready and waiting. I used my version of the Babbling Brook kit, plus a few embellishments that I pulled from my version of the Wildflower Kit - and look - a patterned paper background! Unbelievable! That's twice in a row! 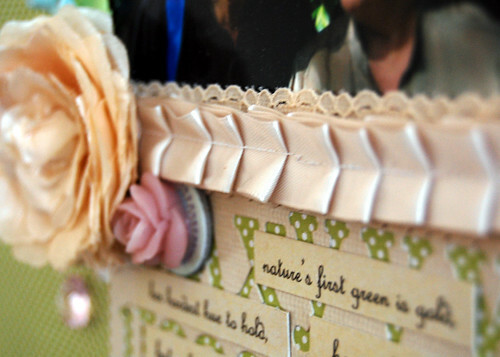 There was also an additional challenge to accompany the sketch of using a ruffle somewhere on your layout, so I made my own ruffled ribbon out of some cream satin and added it beneath my photograph. 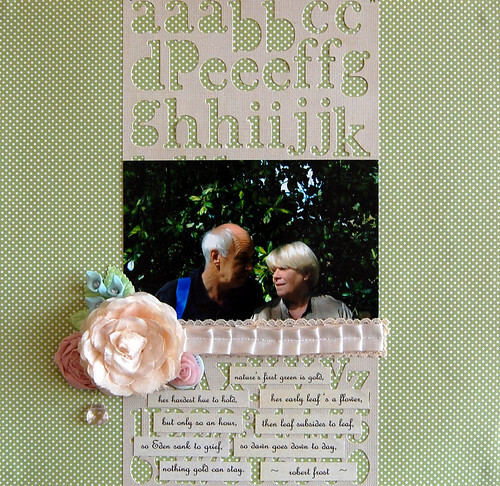 Then I clustered all of my embellishments together to form a focal point and to break the lines of the layout a little. I included one of my handmade rolled roses, some polymer clay leaves, one of roses from my original kit and a cabachon glued onto a chipboard button. Lots of extra used in such a small space. Loving it! But, there was something missing. Just beneath the cluster of flowers there was a little space and every time I placed another flower there it just didn't look right. I was at a bit of a loss and put the layout to one side for a whole week before inspiration struck. I'd headed back to The Counterfeit Kit Club and noticed the Inspired By Etsy Mini Challenge then and immediately went to search through my favourites. When I came across these beautiful Temple Lotus Hoops by Lala Design Studio, I knew I'd found the cutest, little addition to my layout. 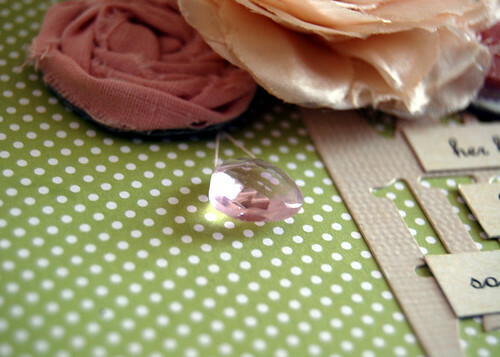 One dinky, pink glass teardrop bead and I finally had the perfect layout. Very clever idea! I love this page and all of its beautiful details! This is a really nice page! I love how you used the alphabet paper. Nicely done! It's beautiful. So fresh and pretty. This is absolute perfection. I love everything about it starting with you use of the negative of letter stickers. The poem is beautiful and your embellishments are gorgeous. Really lovely - well done. This is a stunningly beautiful layout Clair, it is so calm and peaceful and really ... just lovely :-) Your use of colour and texture is once again spot on! That little teardrop bead was the perfect way to fill the space! Oh so beautiful. This is a very pretty page and the rose tear drop is the perfect touch. It's one of the first things that caught my eye. Oh, this is soooo pretty!! I love the clustered embellishments! This is really beautiful! I love the delicate feel of it and the alphabet background. Just stunning. I love everything about your layout! Gorgeous...well done! This is just beautiful, Clair! I love the alphabet image you used as a background piece too. Very clever! stunning. i am a cluster freak so that grabbed me right away. the sparkly dropper is a wonderful addition. glad to have found you!